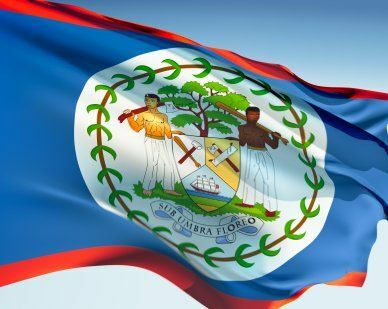 The flag of Belize has the most colors of any flag. Its background is royal blue with a thin horizontal stripe of red at the top and bottom. In the center there is a white circle, with a coat of arms that boasts 50 olive leaves surrounding it. Images of a man with an oar and a man with an axe flank the shield. Below the men is the country’s motto and above the coat of arms is a tree. The flag was originally all blue without the red stripes when it was first used in 1950. The stripes were added in 1973 when Belize became independent. Our top-quality Belize flags conform to all official specifications. Emblems and designs are executed with the highest possible degree of accuracy in regard to detail, color shades, placement and proportion to flag size.